I love crafting and really look for any reason to do some new things. At nearly two years old, Ri is starting to get into crafting too. 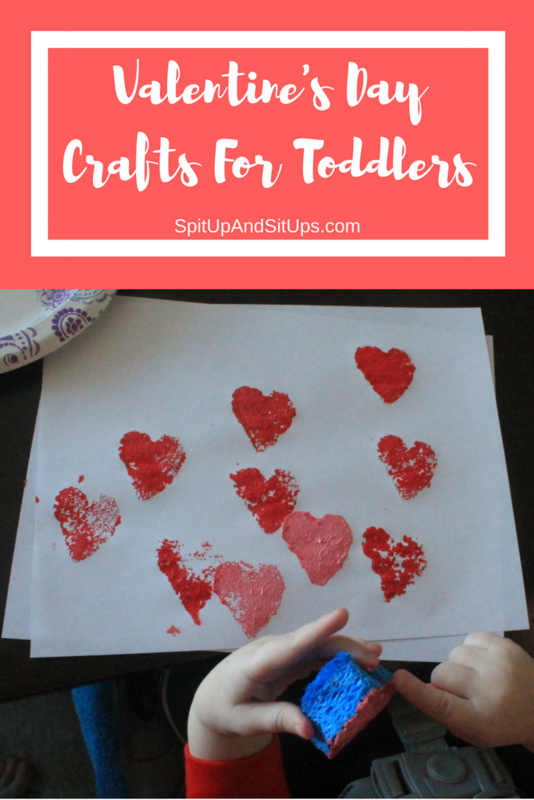 With Valentine’s Day around the corner, we attempted some super easy Valentine’s Day crafts that were age appropriate for toddlers. I love how interactive crafts can be now! When Ri was a baby, it was me doing, oh, 100% of the work and his little hands and feet were basically just my tools. Now that he’s nearly two, crafts are so much more fun! Ri is really into drawing and finger painting right now. He’s not the most fond of paint on his hands and still tries to eat the paint. When do kids stop eating things they’re not supposed to and start eating the dinner I made? 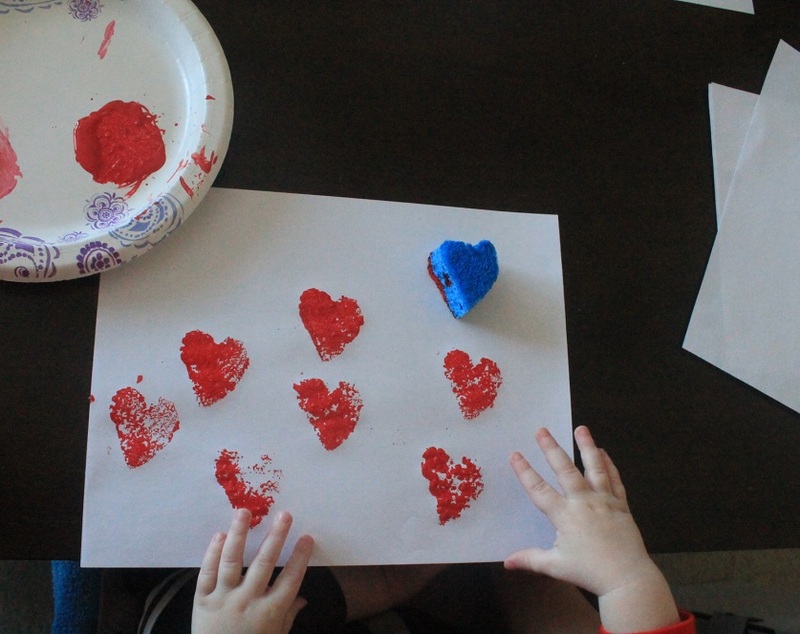 These three easy Valentine’s crafts for toddlers are a lot of fun. 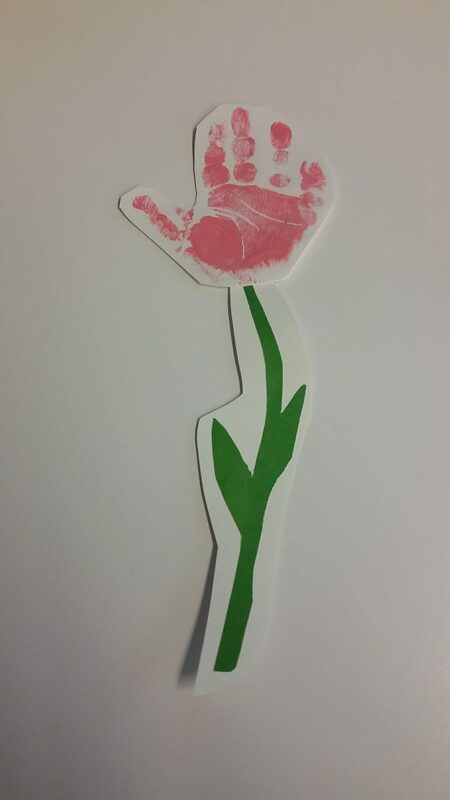 Ri really loved the stamp we created by using a sponge and the hand print flowers are an oldie but goodie craft that can be done at almost any age. The tissue paper “Love You To Pieces” may have been Ri’s favorite. Ripping the paper was so fun and dumping the paper on his head was even better. This is such a cute and easy craft for kids! Ri really enjoys working with his hands lately and this is such a fun craft. He loves stamping the paint onto the paper over and over again. First you’ll want to draw the heart shape onto your sponge. I freehand drew the heart so it honestly wasn’t perfect from the start. I was nervous about “getting it right” but once the shape was cut out it was perfect, even if slightly wonky. Next, cut the heart out. Tip: Use a thinner sponge! The thick sponges are a bit hard to cut. We used a thick sponge and it worked just fine. 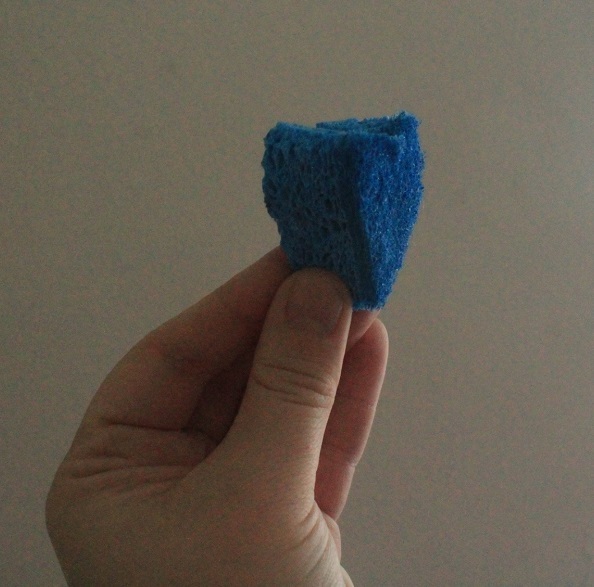 For any other shape I’d need a smaller sponge. Don’t sweat perfection on this part. It’s going to be pretty awesome. Once you have the heart shape sponge ready to go, put your paint on a plate. Dip the sponge and dab onto paper. Ri LOVED this craft so much. The paint lasts awhile from each dab so he really just went to town dabbing the paper. 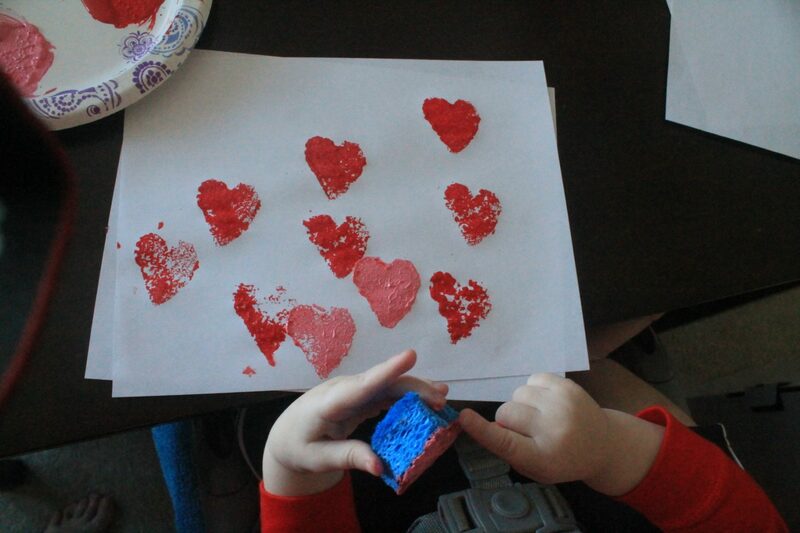 We played with red and pink paint for the heart sponge stamp artwork we created. I really let my son take the lead on this one too. I only stepped in if he thought licking the paint would be a fantastic idea. Note to toddlers: eating paint is not a fantastic idea so just stop trying. 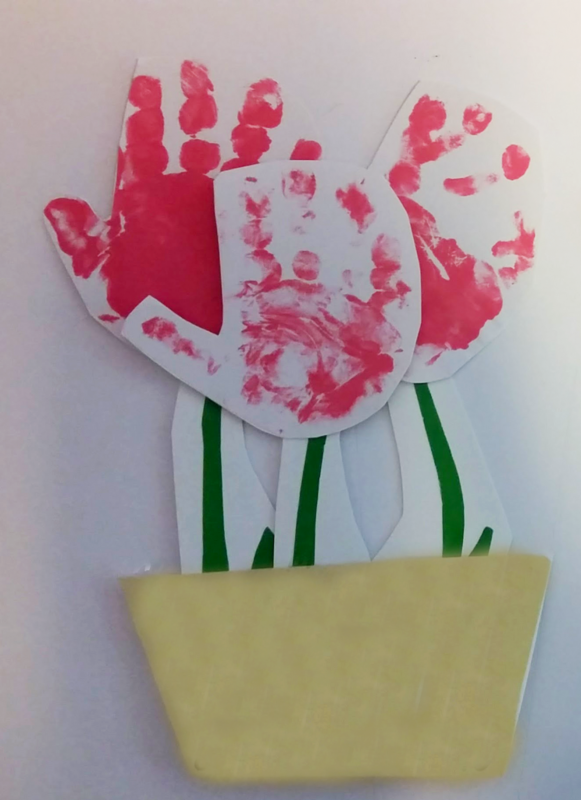 I did this hand print flower pot for Mother’s Day last year, but it makes a perfect Valentine’s Day craft. It was really easy to do, but required a little extra drawing on my part. This craft is definitely perfect if your child is a bit younger too. Cardstock paper – 8.5 x 11 will do! First, I dipped my son’s hand into the non-toxic paint and placed onto the cardstock. I let the cardstock dry and hit MS Paint to create my flower pot and stems. Super easy – use the shape tool for the flower pot and do a quick draw of the stems in green! Print out on cardstock. Once the hand prints are dry and your flower pot and stems have been printed, cut them all out. Glue the flower hand prints to the stems. Glue the stems to the flower pot. Let dry! I use cardstock so the craft will hold up better. Ri had so much fun with this craft! He really loved ripping and tossing the tissue paper around. I was a big nervous that this craft was going to look pretty messy but it turned out really awesome and is something we’re going to have out year round. Cardstock – 8.5 x 11 will do! 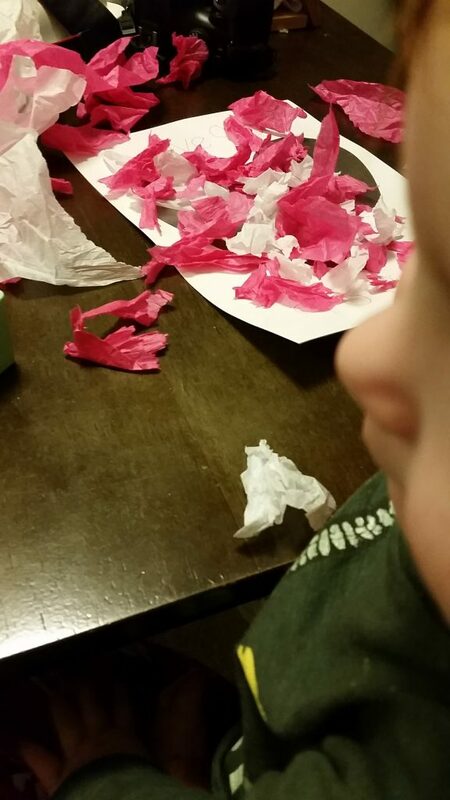 This craft was a lot of fun for Ri who enjoyed tearing the tissue paper to shreds. First, you’ll want to get your child to rip the tissue paper into pieces! Ri enjoyed not only ripping the pieces but balling them together and throwing it around. All over. 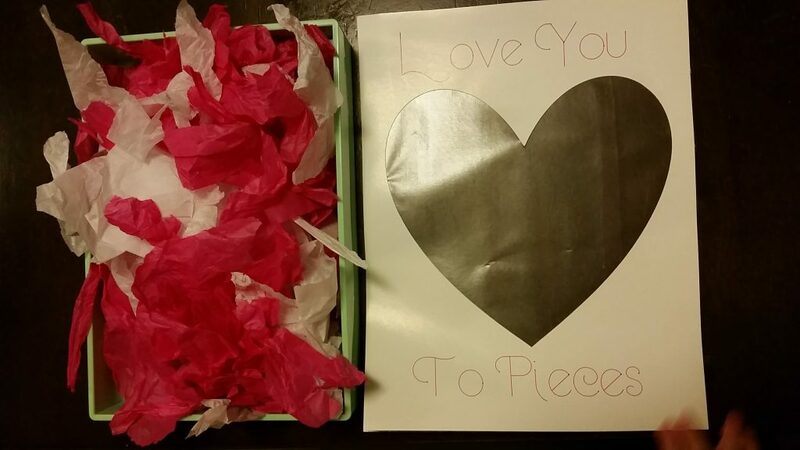 Once you have your ripped pieces, create your “Love You To Pieces” template. In MS Paint, draw a large heart in the center. Above the heart, write “Love You,” and below the heart write “To Pieces.” Print on cardstock so your art will hold up better. Regular printer paper will work fine if you’re in a pinch. The contact paper will help strengthen. You’ll want to use scissors to cut the heart out or trace it with a razor. A razor would be more precise, but seriously be careful. This is your warning to go slow and steady if you’re using a razor or straight edge. If you have a Cricut machine, it really makes it easy! Place your heart in your new design ready for cutting. You’ll have in writing “Love You” above the heart and “To Pieces” below the heart. Go! I just received my Cricut machine and it is AWESOME for crafts. The Cricut machine will make the heart cut out for you on your cardstock paper. With the contact paper, place your design on top and cut out using scissors or a razor the 8.5 x 11 shape of your art. You should have your heart open and ready to receive those tissue pieces. Have your child place the ripped tissue paper pieces inside the heart. The paper will stick to the contact paper! Please excuse that I could only get BLURRY PHOTOS of my son. Does anyone have any tips on getting a toddler to stay still? No? Bueller? Because I’ve decided we’re keeping this one out year round, I’m getting a frame and will pop out the glass so it remains 3D! 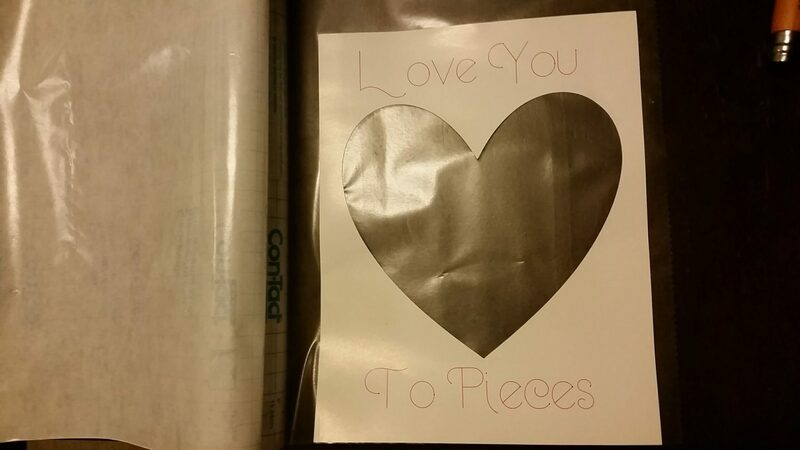 Also, you could get a shallow shadow box or just keep the glass on the “Love You To Pieces” artwork. If you do any of these crafts, share below! 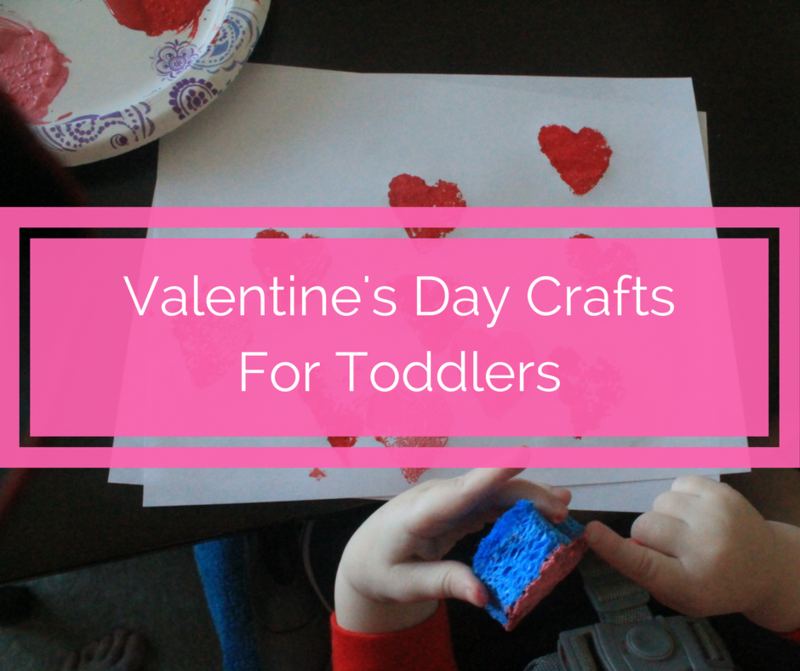 What easy Valentine’s Day crafts for toddlers have you done? Super cute ideas! I may try these with my little one. I especially love the sponge painting! The sponge painting was so fun! Imagine the shapes you can make! My son loved the sponge craft! I am thinking about making a few different shapes for him for a future craft! These are so cute! And it reminds me I have to do valentine’s day crafts with my kids! It’s the perfect time for doing crafts for Valentine’s Day! These are adorable. I LOVE the handprint flower pot! Saving that to do with my daughter!! It’s a great craft to do! Super easy! So many cute ideas, my daughter would love all of these crafts! I love these ideas so much! I have been trying to figure out what to do with the little man for Valentine’s Day and you found the perfect crafts! Kids love paint and ripping paper! Good ideas. These are great ideas to use with my preschool class. Thanks! Those are great ideas. I’m sure my daughter would love this. Thanks for sharing. So fun and easy! I need to go scrounge up some sponges and so this w my kids! 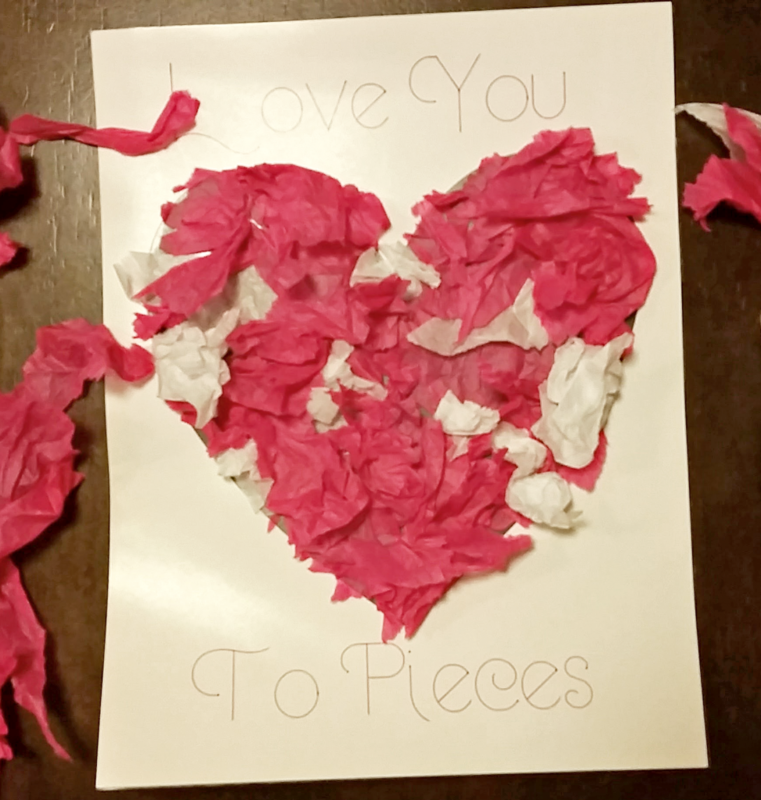 I love the ‘love you to pieces’ project! We did a similar one before where we glued the tissue paper down onto a heart, but this would be a fun way for us to reinvent it. Thanks! The sponge was so fun! Love these ideas! How fun! These are so cute! And perfect for the little ones! I can’t wait to try these out with my boys. These are great ideas! I have a little toddler that loves to make things. I will definitely have to pull some of these out for him! Cute ideas! My kids would love making all of these. And I love your idea to put the tissue heart behind a frame, that’s so smart! It preserves the art! I love it! Super cute ideas! I’m totally going to do a few of these with my son this week! Thanks for sharing! Have fun with the crafts! Really nifty ideas that I can share with my friends who have young kids! Thanks for the comment! It was a really fun craft to do! Such cute ideas! Kids love stamping and paint projects! These are great ideas! 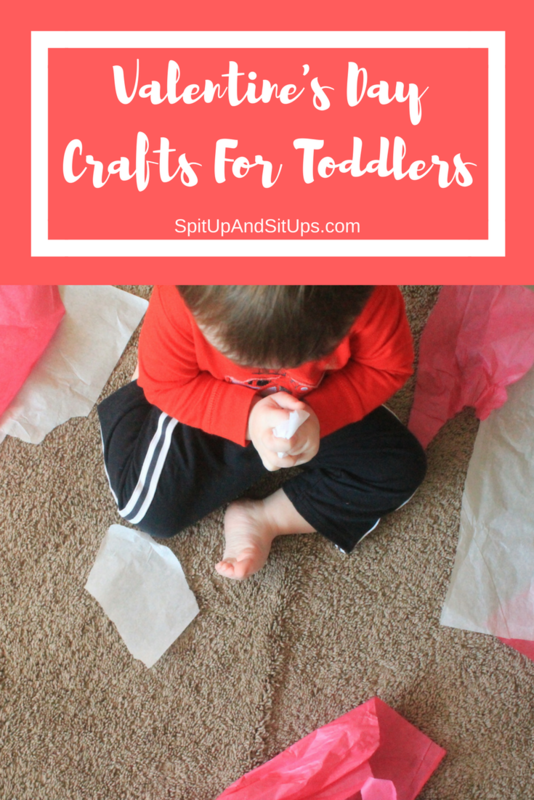 I was looking for fun and easy crafts to do with my 1 and 3 year old! My kids have done a few of these in the past, and they are always a big hit! These are super cute! I’ll have to try it the hand print flower with my kiddos. I love them all but my favorite is the tissue paper heart. My toddler will love it, but I know my crafty older girls will jump at the chance to do this one too! It’s a fun craft! You have to do it! Sometimes (often in the case of toddlers) simple is best! I think we’ll do some sponge painting this week! These are all so adorable!! We did sponge hearts for daddy last year and it was a messy blast!! These projects are so cute! What fun and what great keepsakes when using handprints!! Love the “Hand” flower…probably because it’s simple, it’s easy, and I don’t have to go out and buy anything! 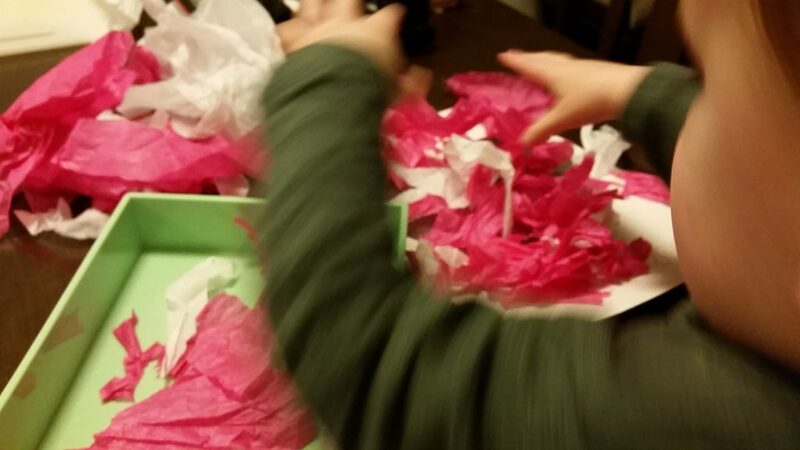 We did the tissue paper heart craft last year and my son LOVED it!! It was definitely our favorite! I love these ideas they are so cute. My toddler would have so much fun!